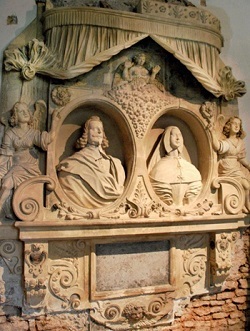 The monument to Sir Edward and Lady Francis Rodney on the west wall of the Rodney Chapel, St Leonard's Church, Rodney Stoke, Somerset: investigation windows were opened up above the monument (top left and right) to ensure there was no evidence of early plaster and decorative schemes, and the hard plaster was removed at lower levels. Our nation's churches, cathedrals and abbeys contain the largest collection of fine art in the country. These priceless heritage assets, often by the greatest designers and craftsmen of their day, are still displayed in the setting for which they were designed. It would therefore be a mistake to think of them as being in any way less important or less authentic works of art than those on show in museums and art galleries. 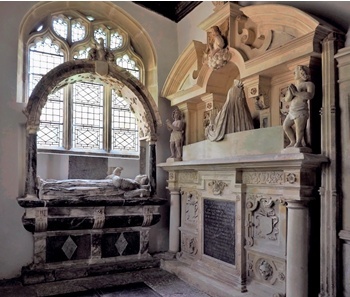 However, church monuments should not be seen as beautiful objects alone: they provide a living record of religious, political and social history and are an invaluable and engaging learning resource. They allow us to touch the lives of those they commemorate and to understand something of how those characters and their families fit into the complex tapestry of history, and they deserve our attention. Because church monuments are not in museum conditions but inside historic buildings in varying states of repair, careful attention should always be paid to understanding the building envelope and the internal environment. Recently, Sally Strachey Historic Conservation has been lucky enough to work on a number of fascinating monuments across the country. In every case the deterioration of structural integrity and surface condition was largely due to the monument’s environment. Improving and monitoring their surroundings forms a critical part of their conservation. Church monuments are occasionally freestanding but it is more usual to find them built into the church fabric and their condition is inevitably a reflection of the surrounding environment. Few churches are used all the time, so almost all are subject to intermittent heating and ventilation, which can have a significant impact on the microclimate around the monument. Furthermore, most churches have been subject to reordering, particularly during the 19th century, and this has resulted in monuments of all shapes and sizes being dismantled, relocated and rebuilt, often in ever-decreasing space. The construction methods used can be complex. Materials include alabaster and marble and a variety of limestones, sandstones and other regional building stones, held together with an internal structure of iron fixings. Larger monuments may also contain a filler material (rubble for example) for structural support. The surfaces and inscription panels may also retain areas of historic decoration, including pigment and sometimes gilding. All these materials are subject to decay mechanisms associated with moisture, either as a liquid or a vapour, which can compromise the structural integrity of the monument and cause surfaces to deteriorate, leading to a loss of detail and decoration. Typically, the cause of structural movement is the deterioration of the system of iron fixings used to construct the monument. Iron is susceptible to corrosion in the presence of moisture and air. This causes the fixings to expand, exerting pressure on the sections of stone and often resulting in dramatic movement through the joints, cracking and buckling. Rust ‘jacking’ has the power to lift substantial free-standing elements, destabilising them. An example of this can be seen on the monument to Robert Dormer (below centre), which is attributed to the great Flemish-born sculptor John Michael Rysbrack. Here, two large sculptures have been lifted out of position through pressure exerted by the corroded iron fixings. 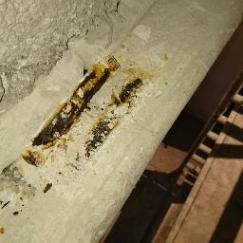 Once the pointing mortar falls out, this type of deterioration accelerates due to the greater exposure of the iron to both moisture and air. The critical factor which draws the attention of the PCC and architect to a church monument is usually evidence of movement through the joints, sections of the monument shifting out of alignment and associated iron-staining on the surface. At this stage a monument may pose a significant threat to public safety and demands investigation. Above left: salt crystallisation damage at a high level caused by warm, moist air condensing on cold fabric. Above centre: the monument to the Hon Robert Dormer (d1726), Church of the Holy Cross, Quainton, Buckinghamshire, showing the location of the iron fixings and the significant movement through the joints caused by the corroding iron fixings. 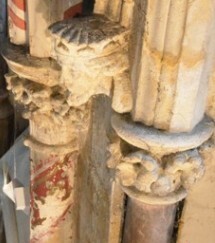 Above right: the canopy to the monument to Sir Edward and Lady Francis Rodney (St Leonard's Church, Rodney Stoke, Somerset) during dismantling showing corroded iron fixings. Surface deterioration often indicates high levels of moisture in the building envelope and the internal environment. Historic fabric will always retain moisture and soluble salts and the management of salt activity is one of the biggest challenges in the treatment and care of church monuments. Cyclical changes in temperature and relative humidity in the microclimate can trigger an acceleration in the movement of soluble salts through porous material towards the surface, where they move out of solution and crystallise either on the surface (efflorescence) or just behind the surface (cryptoflorescence). Some salts are hygroscopic and draw moisture in from the surrounding microclimate, causing them to dissolve and recrystallise in the pores of the material in increasing concentrations. The force of crystal growth, like rust expansion, can be substantial, breaking down the integrity of the pore structure and leading to blistering, spalling and loss to areas of pigment. This relentless decay mechanism is particularly damaging to the fine limestones widely used for architectural detail and monuments as they are vulnerable to damage by sulphates, chloride and nitrate salts. 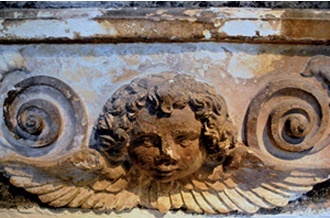 Deterioration of historic paint layers, biological growth and surface staining of church monuments can be associated with the microclimate and repetitive cyclical changes in temperature and humidity. Condensation can form on surfaces which are colder than the general environment, contributing to ongoing salt activity, staining and deterioration of paint layers. The problem of spring condensation in churches – when warm, humid air enters the building and condenses on interior fabric – is well-documented. Because critical decay mechanisms such as the corrosion of iron fixings and salt activity are associated with different forms of moisture, it is essential to reduce the levels of moisture within the fabric. A detailed inspection of roof coverings, rainwater goods and drainage is necessary to identify any defects. This may not be as straightforward as it sounds. Historic churches often have complicated roof structures and drainage systems which have been subject to numerous adjustments. The ground level around churches can gradually become elevated as drainage channels are dug out and other debris builds up. Moisture readings should always be taken on the internal fabric surrounding the monument as well as on the monument itself to assist in understanding how the building distributes moisture. The external walling must also be inspected. Decay and fracturing to the stonework with hairline cracking and failure to the pointing will dramatically increase the levels of moisture immediately behind and around the monument. The presence and extent of cement mortars should be recorded because they reduce the surface area through which moisture can evaporate significantly. Cement mortars also cause ongoing damage to the surrounding historic stonework. The condition of the external fabric needs to be addressed before a monument conservation programme can begin and this can present a significant and sometimes unexpected cost to the local community. Improvements to the drainage system can be complicated by raised ground levels, the presence of underground water systems and more recent interventions. In this case it is recommended that inspection holes are opened up and, if necessary, a ground-penetrating radar survey undertaken. The nature of the internal fabric is an important factor in the movement of moisture and salts through and around the monument. If the monument is surrounded by modern impervious plasters, these will encourage moisture and soluble salts into its more porous materials. The monument becomes a wick to a continuous reservoir of moisture, resulting in increased levels of moisture and associated salt activity. The management of the microclimate around a monument can be more difficult as it is inevitably related to the use of the building and the associated issues of heating and ventilation. Intermittent use of the church results in a rise in internal temperature due to comfort heating as well as a rise in moisture levels from human activity, particularly if clothes are damp. Ventilation can also be problematic as it can introduce increased levels of moist air into the building, thereby increasing the volume of water in the microclimate. When the heating is switched on, the warm air can hold more moisture, but when it cools, condensation occurs on cool surfaces. All the above effects on the internal and external fabric must be considered before and alongside treating a church monument, and in many cases a compromise will have to be reached if the internal environment is to attain the stability it needs. In order to work towards this it is important to consider using the ‘buffering’ provided by the volumetric mass of the historic fabric to control and stabilise temperature, moisture and relative humidity. The improvement and ongoing maintenance of the building envelope is therefore the priority treatment in improving the environment surrounding the monument. To fully understand the microclimate, ongoing monitoring over an extended period is essential to implement a long-term strategy for the church to manage its heritage assets. 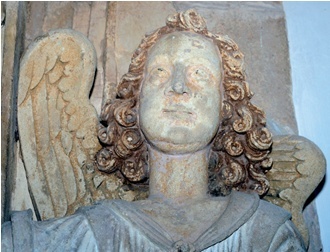 The recent conservation of the Rodney monuments at St Leonard’s Church in Rodney Stoke, Somerset illustrates how decay mechanisms and ongoing deterioration are closely associated with their environment. This group of monuments to different generations of the same family is located in the Rodney family chapel on the north side of the church, and includes five substantial and stylistically distinct examples. Dating from the 16th and 17th century, four are constructed from limestone and one from alabaster. The limestone monuments all retain areas of original pigment which give a valuable insight into the original aesthetic of the monuments. Concerns were raised at the damp conditions in the Rodney Chapel and the rate at which the once vivid colours were fading. Overall, the monuments were in structurally sound condition so it was only necessary to partially dismantle the canopies of the monuments to Sir Edward and Lady Francis on the west wall and Sir Thomas Rodney on the south wall where the iron cramps were suffering from corrosion and causing sections of the monument to become unstable. A detailed programme of cleaning, repair and consolidation of pigment was carried out but the main objective was to slow down the decay mechanisms causing the surface deterioration. As a result, investigating the chapel environment and making the necessary interventions to the fabric were, and are, at the heart of this project. The roof and rainwater goods had undergone a recent programme of repair which had reduced the level of moisture at high level but had not resolved the issues of damp in the chapel. Beginning in June 2016 moisture readings were taken twice a week from 30 locations in the chapel alongside a record of the weather conditions and rainfall. After the first few weeks it became apparent that excessive levels of moisture were being retained in the fabric of the Rodney Chapel including the internal walls and at high level. In some areas there was a delayed response in relation to the rainfall. In discussion with Mark Taylor of architects Beech Tyldesley, the conservators looked more closely at the drainage, foundations and soil levels surrounding the Rodney Chapel. Inspection holes were made to all elevations with investigations at the east end revealing a 1970s drainage system with a brick soakaway. This was found to be too close to the chapel and at a higher level than the floor. It was felt that the soakaway could be contributing to the high levels of moisture throughout the fabric of the chapel and a temporary diversion to the rainwater goods was set up on the east elevation to take the water from the downpipe to the drain at the far south corner. The intention was to allow the soakaway to dry out while continuing to monitor the levels of moisture in the chapel for a minimum of 12 months. 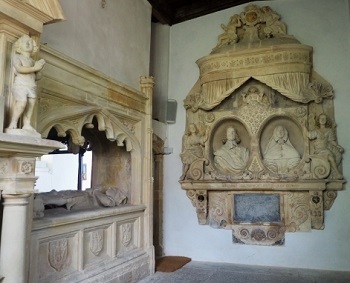 Recent readings after an extended dry spell showed an overall reduction in moisture levels but with high levels still present across the interior wall between the chancel and chapel where the monument to Sir Thomas Rodney is located. The next stage is to take readings after a period of heavy rainfall. The surrounding environment at St Leonard’s is further complicated by the presence of underground water courses running off the Mendip Hills. Test pits were also dug to assess the possibility of installing a French drain. However, the test pit which was dug against the west wall of the chapel revealed that there were no foundations between the original church buttress and the later buttress to the chapel, and there was only soil under the Lias limestone slabs to the plinth. Unlike the chancel, where the floor level was raised during the 19th-century restorations, the chapel is built off the ground with minimal foundations. In this case the porous fabric of the envelope and the monuments will continually draw moisture up from ground level. This underlined the importance of ensuring that the external and internal structure had to manage and distribute moisture as efficiently as possible. Further investigations were carried out between the north porch and the west end of the chapel to find the location and direction of two drains and to determine whether there were any breakages. Both drains were found to be in good order with no cracks or leaks. However, there was an issue where the two drains meet: the drain from the west end of the chapel and the drain from the nave converge in a Y section. In the event of leaves or debris going down the drain there is a strong possibility that they will cause a blockage because this is a non-standard join. The PCC was advised of the importance of regularly checking the mesh installed just below the downpipe to catch leaves and debris. 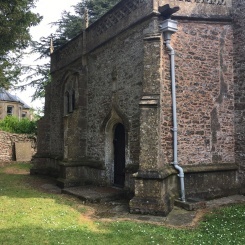 The area of grass between the west wall of the Rodney Chapel and the porch was piled up with debris and soil which was considered to be a possible trap for rainwater to track back into the chapel. The turf was lifted and the debris removed to slope the ground away from the chapel. The turf was then reinstated. The improvements to the internal environment had to take into account how the chapel was used. One of the chapel’s important functions for the community was to act as a changing room for the choir. An electric socket had been installed immediately below the monument to Sir Edward and Lady Francis on the west wall to plug in a heater while the choir changed. This is an area where salt efflorescence with associated blistering and spalling of the stonework was present. The sharp rise in temperature in the microclimate caused by the heater would have accelerated salt activity through this section of the wall and monument. In addition, a heavy velvet curtain had been hung on the north side of St Thomas for privacy and to prevent drafts, which reduced the airflow around the monument. The socket and electrics were relocated from the west wall to the north wall near the door with advice to raise the temperature only to the minimum required. The velvet curtain and fixings were removed and the surface of the monument repaired. The parish was advised to invest in a folding screen which could be installed before and for the duration of services. The internal wall around the monument to Sir Edward and Lady Frances Rodney had an extremely hard ash plaster. After discussion with the architect, this was removed and replaced with a lime plaster made from lime putty which had been aged for 20 years, and it was then given three coats of limewash toned to match the surrounding walls. The use of aged lime putty produces the most plastic mix, so the plaster adheres extremely well and is less likely to crack. 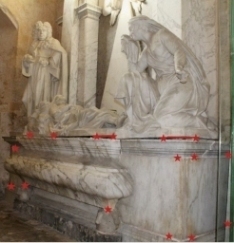 Its purpose was to reduce the movement of moisture and soluble salts through the porous stonework of the monument and to slow down the decay mechanism associated with loss of surface and historic pigment. The new lime plaster also creates a large surface area through which vapour, moisture and salts can move freely to the external elevation. The Rodney Chapel’s environment is complex and although critical improvements have been made towards stabilising and better understanding the internal environment, it will be necessary to continue to monitor the moisture levels. The parish was advised to install an environmental monitoring system in the chapel to monitor it over the long term. The information can be collated to gather a more comprehensive overview of the performance of the building envelope in order to develop a robust strategy to manage the environment of this delightful church. SALLY STRACHEY is managing director of Sally Strachey Historic Conservation Ltd. She trained as an art historian and was awarded an ICCROM fellowship at the Bonn Conservation Workshops in 1984. She was a founder member of the UKIC stone section committee and of the Nimbus Conservation Group. She is a CPD reader for PACR accreditation and an HLF Mentor, and she lectures at the universities of Cardiff and Bath.